Yesterday we showed you the webisode, and today we're showing the whole space! Our client was a dream. She loved everything Studio McGee, and trusted our direction completely. Her style leans modern, and she needed a space that was durable for her kids and pups. This calls for surfaces that are easily cleaned, floors that withstand scratching, and a large sink. 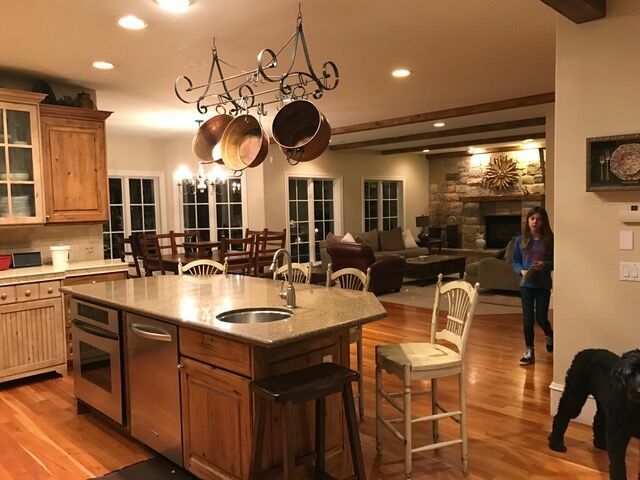 Based on the "before" photos, it's clear to see the kitchen had some strange angles to be dealt with. Everything felt off-balanced and the dark, heavy cabinetry only made the angles look worse. Our first step was to design a cabinetry layout that felt lighter, allowed more light in, and distracted the eye away from the angled walls. We were very drawn to the idea of a cool blue on the island, and our client was totally on board. We went with Charlotte Slate by Benjamin Moore! 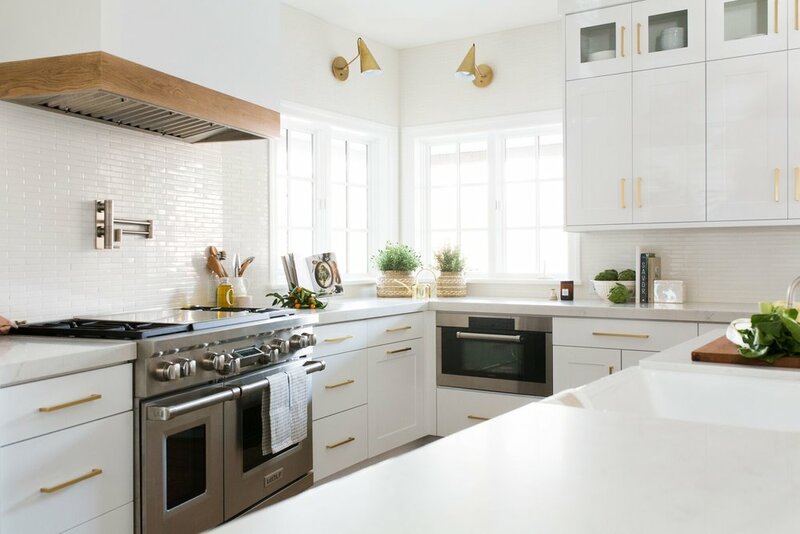 We selected modern white and brass pendants and warm wood stools for the island. We kept the surround cabinetry white so the kitchen still felt bright. The countertops are a quartz that looks like marble - adding an organic touch while still being very durable. As usual, we love to mix metals so we opted for plumbing fixtures in satin nickel. The floors are Hallmark Alta Vista Laguna - which is a great material for durability and hiding dog scratches. All of these materials combine to make a beautiful modern kitchen that still has enough warmth to belong in the more traditional home. It feels light and bright! We needed the backsplash to make a statement, but in a subtle way. We opted for a white ceramic 1x6 tile backsplash and carried it to the ceiling. White tile is classic, but the narrow/long size felt more modern and unusual! The Aland Stripe Rug is soft, neutral rug that's fitting in so many different spaces. Malia Seagrass Baskets make darling planters in the kitchen. We love that the pattern is minimal and textured, so it brings the space to life while keeping with the clean modern look. The gold watering can is always a beautiful addition to your countertops, especially when displayed next to greenery! The dining room is the in-between space that links the living room and the kitchen, so it needed to tie into both spaces. In the dining room, there was had a large square table that felt squished in the long space. Our client requested a new beautiful light fixture and a table that could seat eight. We loved the idea of a warm wood table with modern black chairs and a more transitional chandelier. Its shape is modern, but it is formal enough to belong in a traditional home. The black chairs and chandelier make a bold statement in a light and bright space. They really wanted to let a lot of natural light in - so we did not put any window treatments up in the kitchen or dining room.